Notting Hill-North Kensington is a district in west London. Notting Hill is a popular destination for its lively market, gorgeous streetscapes, interesting history and diverse population. It has acheived a level of fame from the eponymously named Hugh Grant film (he actually does live here! ), the world famous Portobello Road market and of course from the annual carnival. The area was rural until the 19th century when it was developed as an upper-middle class suburb with quite large homes. During the early 20th century, these large homes were divided into low cost housing which often degenerated into slums. In the 1950s, many Caribbean immigrants settled in the area. In the 1960s it attracted musicans and artists and Portobello Road became the centre of English hippie culture. 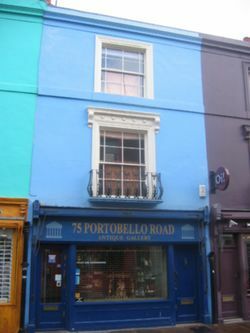 Portobello Road still hosts a very eclectic weekly market and is also home to a similarly off-beat set of permanent shops. The Notting Hill carnival was first staged in 1964 as a way for the local Afro-Caribbean communities to celebrate their own cultures and traditions. After some rough times in the 1970s and 1980s when it became associated with social protest, violence and huge controversy over policing tactics, this is now Europe's largest carnival/festival event and a major event in the London calendar. It is staged every August over the Bank holiday weekend. During the 1980s, the Notting Hill proper area of the district was largely gentrified although areas in the north west of the district at Ladbroke Grove and Westbourne Park remain deprived and run down. In local mythology, these more recent residents of Notting Hill are assumed to live from trust accounts, giving rise to the practice of classifying locals as either Rastafarians or Trustafarians. 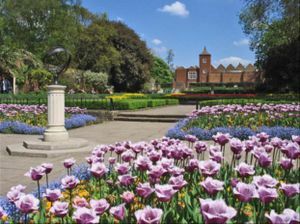 Further west from Notting Hill providing a natural buffer between the north and south of the Royal Borough of Kensington and Chelsea, is Holland Park. This is the least well known of London's Royal Parks and locals would like to keep it that way. A real a gem of a park which is off the tourist trail but very much worth a visit. The area is best explored on foot and lends itself well to walking. Food-wise there is so much to choose from, and something to suit all budgets. If you are budgeting then there is great Malay food, bangers & mash, falafel and German sausages. For those with a bit more money to burn there is some seriously swanky bars and restaurants including E&O and 192. Some of the most popular dishes sold along the route of the carnival are jerk chicken and goat curry. Populated by the young, hip and rich it is unsurprising that Notting Hill has so many trendy bars. Expect to pay prices that match the location though. This page was last edited on 11 March 2019, at 11:16.